Grant a level two International Tennis Federation certified coach, is on a two-year coaching assignment with the Rass-Al-Hamra recreational club, located in the capital city of Muscat. Grant told SEARCHLIGHT that he was able to land the deal through Belgian Eddy Vanppen, a former tennis director at the Raffles Resort in Canouan. Grateful for this opportunity to showcase his expertise elsewhere, Grant disclosed that his responsibility will be huge, as he will be in charge of about 1,500 children between the ages of five and fifteen years. Grant is cognizant of the challenges of an almost entirely different culture in Oman. Prior to his departure for Oman, Grant worked in Mustique with the Mustique Tennis Club. 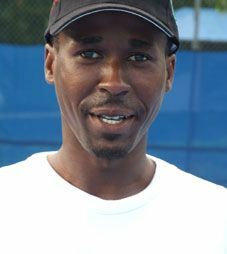 One of the coaches with the Grassroot Tennis Club, Grant was part of the initial technical team when the club was set up in February 2010, and offered his services to the GTC whenever he was available.